As a big, city centre hostel our booking and check in policies are quite strict and in place in order to keep hostellers, hostel and staff safe. ID POLICY: We take a photographic ID or HI membership card from everyone as a key/security deposit: IDs are held at reception until check out. We don't ask for passports (unless you want to leave them for safekeeping). Please note that this is one ID per guest, not per booking. GROUPS: Online bookings are limited to 6 people: this includes bookings made under different names or on different websites. Please contact us directly to book for more than 6 people, otherwise check in will be refused. FAMILIES: please book a bed for all children aged 4 and over travelling with you. Children under 4 stay free if they share a bed in the room booked. Under 16s are not permitted to share dormitory rooms with strangers, so please book a private room (all of the beds in a 4 or 6): contact us after booking to let us know you are travelling as a family so that all of your beds are allocated together. 16 and 17 year olds can only share a dorm when accompanied in the same dorm by a parent or legal guardian. BREAKFAST is not included, but may be purchased at Causeway Cafe on the ground floor after 8am. WiFi is free and now available, with limited access (basic browsing and emailing), throughout the hostel: WiFi is not available upstairs after 23.00. PAYMENT: payment in full is required on arrival in cash (GBP) or by credit/debit card. We are not able to process refunds. No shows are charged for the first night of a stay. Cancellations made after 13.30 the day before arrival are also charged for one night as a late cancellation fee. UPDATE: If you make a booking and fail to appear at the hostel without cancelling (i.e. you are a “no show”) three times in a 24 month period then HINI reserves the right to decline all future bookings/stays from you regardless of whether we have been able to successfully charge your debit/credit card or not. The same applies to those making, and cancelling, multiple reservations. CAR PARK: we have limited spaces: guests park on a first come first park basis and space cannot be guaranteed. Hostels come in all shapes and sizes: we are not a 'party hostel': our hostel quiet time is 23.00 to 7.00: food and alcohol are restricted to the kitchen/dining room area on the ground floor (this area closes at midnight). We are unable to accommodate stags, hens, teams (apart from school and junior teams) so that we can provide a quiet, comfortable and relaxing place to stay. Only registered guests have access to the hostel. Hostel management always reserves the right to refuse check in. If you have any additional needs please contact us and we will do our very best to accomodate them: however as facilities and resources are limited this may not always be possible. Just off Shaftesbury Square (bus route 8 or 9) in the city centre. We are located between City Hall and Queens University, a short walk from both. 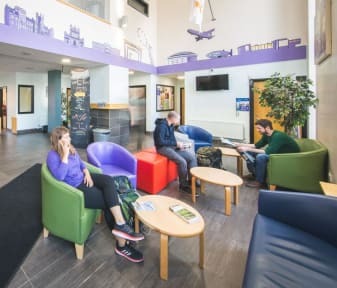 We are the closest hostel to the Europa Bus Station and just around the corner from Botanic Rail Station, for direct connections to Titanic Quarter. Belfast's biggest, longest established hostel: no gimmicks, just clean, safe accommodation. A perfect base from which to explore the city and its history, ideally located for a walk through the university area, along the river to the ever-changing waterfront and Titanic Quarter, or to the shops in the city centre. We have rooms to suit all budgets, from a basic cheap dormitory bed to a double with private shower/toilet: the TV is in the TV room and the kettle in the self-catering kitchen though! We welcome guests of all ages (from 2 to 92!!!) from all over the world, including solo travellers, couples, groups of friends, families with children and groups. Our self-catering kitchen is fully equipped and open from 6.00 to 11.00 and 12.30 to midnight. There is a plentiful supply of hot water during the day, and our central heating is on from 7.00 to midday and 19.00 to midnight (the building is not heated during the summer months). We are open and staffed 24 hours a day with no curfew or lockout. There is a luggage room for storage before check in and after check out: this is also provided free. All of our rooms have bunk beds, apart from our en-suite twins and doubles. Standard twins are small (half the size of a standard 4) and designed for those seeking a budget room but some privacy, rather than extra space or comfort. The shower rooms in our en-suite rooms are designed as wet rooms, with no shower doors or curtains. Towels and soap are not provided. The building is No Smoking in line with the law in Northern Ireland (in house fine: £200): the hostel also reserves the right to charge a fine of up to £200 for extra housekeeping, damage and so on after check out. Excellent location in the city with very welcoming staff. Upon our early arrival staff suggested a wiidenvariety of attractions we may wish to see - this trusty map guided a couple of days in the city! Bathroom facilities were clean and spread throughout the building which made for easy acces and no queueing, out only (minor) gripe was that the taps and showers time out so quickly that you have to shower with your hand on the button to allow water to heat up. There was an on going problem with the key cards. Sometimes they had to be changed and often it took multiple attempts to open the door to the room. Others experienced this too. The rooms need shelves above the beds. Some of the 3rd floor showers did not have hooks for clothes and towels or shelves for soap. Basic hostel very close to the centre of Belfast. Room as you would expect for a hostel. Washing facilities could have been cleaner. Did the job. Highlight for us was the cafe serving reasonably priced breakfast. Delicious!! Very Convenient Location, the city centre is just a ten-minute walk away. The Causeway Cafe located within the hostel was awesome, very convenient and had great food for low prices. The shower/wet room was constantly flooded. However, the room was clean and had a sink in it. Comfortable and reasonably quiet -- for a hostel. Only drawback is that it's a bit like a maze. Belfast was a great place to stay and this hostel was nice. No frills, but I enjoyed having a cheap private room. Staff was nice. Very happy - this was a one-night stay only so covered my needs for a night out with friends, In the shower-room the water was barely luke warm and the drainage was slow to clear, both in the shower-room and the bedroom sink. Our review rating is rather high, mostly because security and location are both good. However the room we had (twin no en suite) was pathetic. Two bunk beds in a tiny room with a sink and 2 lockers. The shared bathrooms are not pleasant either and the showers weren't hot or powerful. On the plus side the onsite cafe was fine for breakfast (though doesn't open early). There is parking to the rear which was useful and the members of staff we met were nice. Overall, ok to sleep here but basic. Shocking hostel. Mould and damp on the ceilings of and in the shower cubicles. Beds were rock hard. No atmosphere really. For the price, would have expected breakfast to be included and some other facilities, particularly en-suite toilets for each dorm. The only positive really was security, as you needed your keycard to enter the elevator or stairs, floor and room. Location was okay, but definietly able to find other hostels in Beflast of better quality and value.